One of the widest ranges of 2019 Cricket helmets in the world! One of the most important pieces of cricket protective equipment is a cricket helmet. 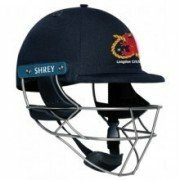 Cricket helmets have protected batsmen, wicket-keepers and close fielders from serious injury for many years now, and the technology involved in keeping cricket players safe improves every year. All Rounder stock one of the widest ranges of 2019 cricket helmets in the world. 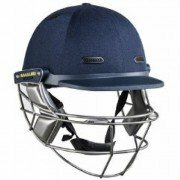 Our range of batting helmets suits and level of cricketer, with a wide range of brands (including Masuri Vision, Masuri Original, Shrey helmets, Gray Nicolls helmets and Kookaburra helmets), sizes (including junior cricket helmets) and at prices to suit any pocket. We also stock products from Shrey, Gunn and Moore, Spartan and Albion. Being such a fundamental piece of equipment, literally a life saver with critical head protection, here at All Rounder we recommend adhereing to the ECB guidelines that all junior and senior players possess a helmet within their bags. With prices and levels to suit all ability of player it is a small price to pay to protect against serious injury. An improvement in player safety had been identified by the ICC. In response, Masuri developed The Vision Series – an innovative new range of cricket helmets which incorporate a number of features focusing on safety, comfort and design. This design is so unique that it has been patented, meaning that this feature is exclusive to the wearers of Masuri Vision Series. The added safety features of the Vision Series gives players confidence in the knowledge that they are protected while they play. This range exceeds new safety standards and sets the bar for cricket helmet design. As part of the Vision Series range, the Elite Personalised Titanium Cricket Helmet otakes into account players vision and comfort whilst ultimately ensuring their protection at the crease. Masuri’s Eye-Line Grille includes an additional bar which is placed on the eye-line of the player. This extra bar acts as an additional safety measure by forcing the ball upwards towards the helmet’s peak, away from the player’s face. As with all of the Vision Series helmets, the Elite benefits from Masuri’s Halo-Reinforcement System (HRS) which minimises movement between the peak and the grille. The interaction between these two elements is key in preventing facial injuries. The Titanium grille offers a significant weight saving, whilst maintaining it's superb levels of safety. Masuri’s innovative Air-Flow cooling system incorporates strategically placed vents within both the inner and outer shell of the helmet. This allows air to circulate freely within the helmet, keeping players cool while they play. The Vision Series helmets benefit from a ‘Twin Shell’ which adds extra protection and significantly reduces the chance of concussion related injuries. Designed with safety standards and comfort in mind, the Vision Series Test helmet provides a high-level of impact protection. As with all of the Masuri helmets in the Vision Series range, the Test benefits from Masuri’s Halo-Reinforcement System (HRS) which minimises movement between the peak and grille. The interaction between these two elements is key in preventing facial injuries. The titanium grille offers a significant weight saving, whilst maintaining it's superb levels of safety. Masuri’s innovative Air-flow cooling system incorporates strategically placed vents within both the inner and outer layers of the helmet. This allows air to circulate freely within the helmet, keeping players cool while they play. Our Vision Series helmets benefit from a ‘Twin Shell’ which adds extra protection and significantly reduces the chance of concussion related injuries. The Masuri Original Series helmet returned with upgraded safety including single shell protection, providing an affordable and lightweight helmet for the cricketer that prefers the traditional style Masuri helmet over the new, high tech Vision Series range. Obviously, all new safety requirements are met and surpassed, as one would expect from Masuri. OS2 utilises the soft cell foam front and back liners to contour to your head shape, ensuring a snug fit every time without the need for a cumbersome adjustor. Masuri combines modern manufacturing techniques and the latest technology in plastics, along with Masuri's traditional DNA in order to bring back the Original Series range. This was a favourite for many years with international players all over the world and OS2 can currently be seen being worn by Brendan McCullum, Jos Buttler, Ben Stokes, Eoin Morgan and Jonny Bairstow to name a few! The Vision Series Test is built for a high level of impact protection and comfort. Strategically-placed vents in the inner and outer shells improve air-flow, and the new reinforced rim (HRS) minimises movement between the solid peak and certified steel or titanium grille, giving the Vision Series Test strong protection performance. The Vision Series Test model grille uses certified grade 5 titanium. It also incorporates advanced manufacturing techniques to give greater protection. Masuri’s Halo Reinforcement System (HRS) is an extra strength helmet rim featured on every model in the Vision Series. Made from the latest reinforced plastics, HRS significantly increases protection by ensuring minimal deformation of the helmet shell during impact. The Vision Series Test is built for a high level of impact protection and comfort. Strategically-placed vents in the inner and outer shells improve air-flow, and the new reinforced rim (HRS) minimises movement between the solid peak and certified steel or titanium grille, giving the Vision Series Test strong protection performance. The Vision Series Test model grille uses certified high grade stainless steel. It also incorporates advanced manufacturing techniques to give greater protection. Masuri’s Halo Reinforcement System (HRS) is an extra strength helmet rim featured on every model in the Vision Series. Made from the latest reinforced plastics, HRS significantly increases protection by ensuring minimal deformation of the helmet shell during impact. 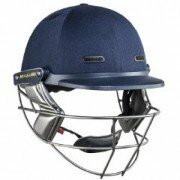 The Masuri Original Series Legacy Cricket Helmet is brand new from Masuri, with a tradtional look and steel grill! 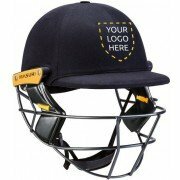 This affordable but lightweight cricket helmet was popular with the likes of Jaques Kallis and Brian Lara and will prove popular this season! THE Stemguard is a clip-on attachment which provides additional protection for a batsman’s vulnerable neck. The StemGuard attaches to existing Masuri Vision Series helmets with moulded clips. The attachment has been designed to give batsman free movement, while offering protection to the vulnerable region at the back of the head and neck. 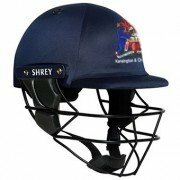 The Shrey Masterclass Air Titanium has been extended at the back for increased safety.Currently used by Indian Premier League and Big Bash stars such as: AB De Villiers, Eoin Morgan, Moeen Ali, Virat Kohli, David Miller, Chris Gayle and many more. Gray-Nicolls cricket helmets have continually evolved in terms of design and materials, reducing weight and increasing in player comfort. Gray-Nicolls were the first manufacturer to gain the approval of both the Australian and British Standards, and like their other cricket equipment, Gray-Nicolls cricket helmets strike a magnificent balance between protection, durability and comfort. Gray Nicolls helmets are super-light, ultra-comfortable and most importantly they are mega-safe. 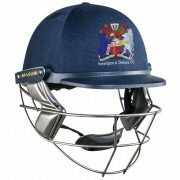 Gray-Nicolls cricket helmets boast a fixed Apex grille has been designed to give players maximum coverage and vision from a factory fitted grille. A contoured reinforced peak has also been designed to combat the fastest bowlers and allow the batsman to concentrate fully on the battle between bat and ball. Test cricketers, IPL and Big Bash stars such as Alastair Cook, Jonny Bairstow, JP Duminy, David Warner and Chris Woakes trust Gray Nicolls for their cricket protection and so should you!